Lung tissue naturally breaks down with age. Smoking, however, speeds up this breakdown, causing smokers to develop lung disease at an abnormally young age. Nowhere is this shown better than the Fletcher-Peto Curve below. The curve was created by Charles Fletcher and Richard Peto by using data from an eight-year study of working English men. It was published in a 1976 report, "The Natural History of Chronic Bronchitis and Emphysema." The curve is criticised by some due to the short duration of the study. Still, regardless of its limitations, COPD experts were so impressed by it that they even used it when defining the disease for the Global Initiative for Chronic Obstructive Lung Disease (GOLD) guidelines. The study measured FEV1 by spirometry over the eight-year period. This is essentially the measure of how much air a person can exhale, after a deep inhalation, in one second. It's a measure of expiratory airflow. Learn more about FEV1 and lung function from my previous post. 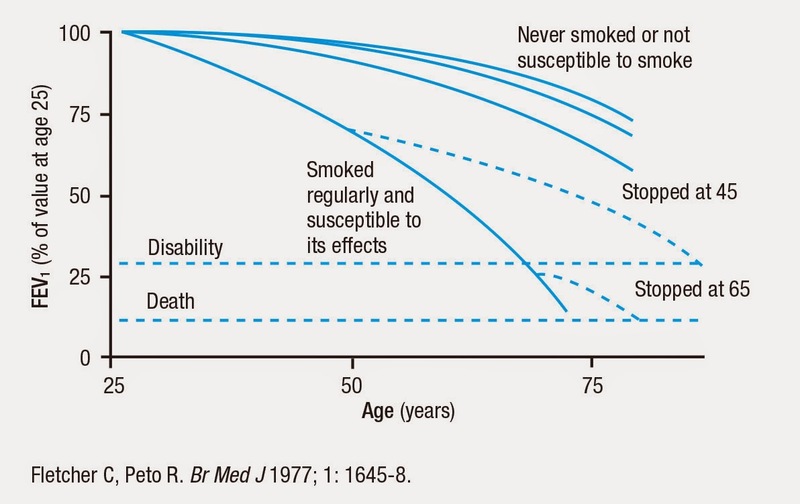 The chart shows that people who never smoked will lose lung function over time, and this process increases with advanced age. This explains why people over the age of 75 who never smoked develop what is called senile emphysema. It's a natural process. For those who chronically smoke cigarettes, this natural loss of lung tissue and airflow will speed up by as much as 50 percent compared to those who never smoked. Usually people who smoke will start displaying symptoms -- like a cough or shortness of breath with exertion -- between the ages of 35 and 45. But most do not recognize these symptoms before the age of 55, mainly because the disease progresses so gradually, and most people simply attribute it to the normal aging process. This might explain why over 12 million Americans have COPD but don't know they have it. So the age of 55 is the average age at which symptoms become so severe that they require the need to seek medical attention. Usually, by the time this occurs, about 50 percent of lung function is already lost. There is one other statistic that came from this report: about 13 percent of people who smoke will develop COPD. This percentage is often rounded off to 15 percent, and sometimes 20 percent. Recent studies, however, have upped it to as high as 50 percent.But more research is required to support this number.